When Stillwater released Stateside Saison in 2010, its first commercial beer, it presaged two huge beer trends that are still evident today – juicy hops and mixed yeast. Now, as the brewery re-releases its flagship offering in more accessible (and cheaper) 16-ounce cans, it’s remarkable how well the recipe holds up to the competition seven years later. For many East Coasters, Stateside Saison was part of our introduction to the Nelson Sauvin hop, a New Zealand variety that was developed in 2000 and would catapult to brewing stardom over the next decade. (Out West it began in 2006 with Alpine Brewing Company's Nelson IPA.) It's the first "it" hop I can remember since Sierra Nevada first boasted about their whole-cone Cascades. I remember the sun-dappled deck I was on when I first encountered Nelson Sauvin, in a then-new IPA by Lagunitas called Little Sumpin' Sumpin'. It bowled me over: gushes of white grape, not just aromas but all over my palate. Bursts of gooseberry and a hint of passion fruit. I stared at leaves fluttering in the breeze, and a single word materialized in my mind: juice. I also remember the back porch where I tried the hop for the second time, in this first release by Stillwater. I was still reeling from this new level of quench, and this beer pushed it even further. Waves of guava nectar crested and fell roundly, with none of the IPA bitterness. Instead, they flowed under shining rays of peach from farmhouse yeast. Today, when it's career suicide to brew beer without the words "juicy" and "tropical," Stateside Saison stands tall with its original recipe. Human history is filled with myths and legends that shape and define our culture. Rituals, celebrations, gatherings.. whatever. One thing that's for sure is we enjoy a proper shindig. So let's get the stories flowing and share a little 'Folklore'. A bracingly deep ale, built dark and rich with an elegantly lean body accompanied by heady aromas of Belgian yeast, earthy hops and gently kissed by a wisp of smoke. 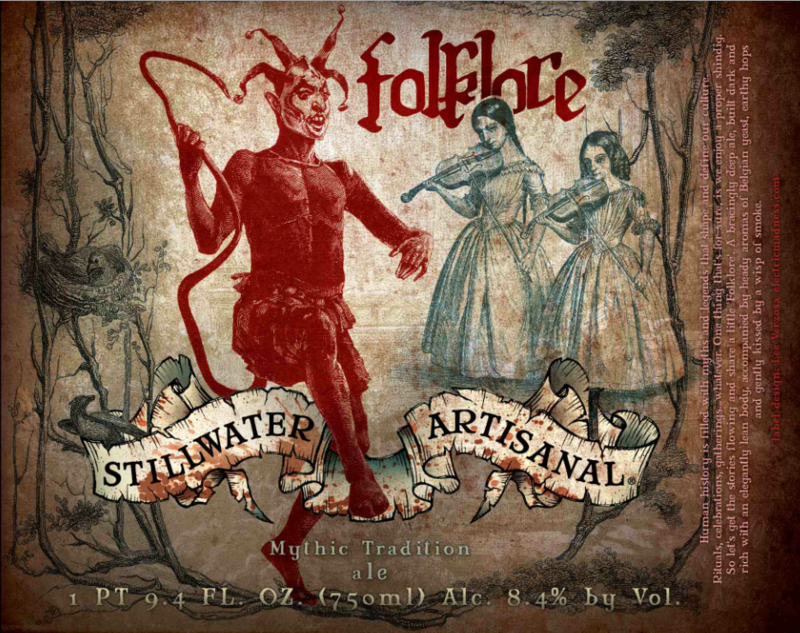 The art features a satyr-like jester, blood-red and tailed, flanked by dead-eyed twin Victorians playing violins in the woods. It’s no wonder Strumke gets along with Evil Twin’s Jeppe Jarnit-Bjergsø, a sometime collaborator and fellow rhetorician. From the beginning, Strumke had a reputation as a yeast whisperer, and he often deviated from traditional styles by harnessing different microflora. At a beer event early in his career, I remember him describing his homebrew days with yeast and bacteria cultures fermenting in jars under his bed. A classic case is Stillwater Premium, a riff on macros cut with rice and corn – and fermented with saison yeast and two strains of Brettanomyces. It tastes like a marriage of Saison Dupont and Miller High Life. It'd threaten to be my favorite beer, if I could find it regularly. When Stillwater started in 2010, working sorcery with wild yeasts like Brettanomyces was worthy of all this enigma. It was still a curiosity. Today, many more people are on a first name basis with "Brett” and familiar with Stillwater's whole approach – something you can see in the new raft of redesigned cans and bottles. The new designs are courtesy of Michael Van Hall, a D.C. artist who works as the Committee on Opprobriations. He's known for his Single Hop Project, a series of modernist posters, each commemorating a hop variety in shapes and Helvetica. Like Strumke, Van Hall talks like an artist, prioritizing his intent and vision over sales. "If I can figure out what Brian's trying to achieve, then I can go and represent that visually,” he said. “And I can get my commentary in there as well." He draws inspiration from all over; personally, he likes skateboarding companies from the '80s and '90s, like Alien Workshop and World Industries. Their stories, their explosion and daringness at the time, is similar to craft beer today. For Stateside Saison, still one of the brewery's main offerings, he wanted to split the difference between expected and artistic. With a name like Stateside, red, white, and blue was a natural starting point, and the idea of "coming stateside" led to the waves motif. The curly font is intentionally friendly, a clear contrast from the old Stillwater labels. "We don't want to be only for beer nerds. I want to reach the macro beer people with this,” Van Hall said. "The red, white, and blue can be 'America, woo!' or it can be commentary." How should we read that commentary? That's up to the beer-holder, of course.